2015 marked the twentieth season for the IndyCar series. As in recent years, the season opened in March at Saint Petersburg and ended in late August at Sonoma, California. There was a total fifteen race weekends and only one double-header event (Detroit). The series used the fourth generation Dallara IR-12 which was introduced in 2012 to replace the Dallara IR5. Chevrolet (Chevy IndyCar V6) and Honda (Honda HI14TT Indy-V6) were still providing 2.2-liter twin-turbocharged V6 engines for the series. 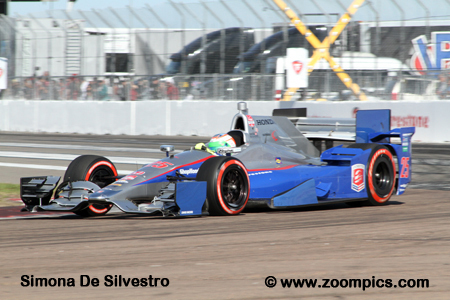 The opening round of the 2015 IndyCar series took place at the fourteen-turn 1.800-mile temporary street course in St. Petersburg, Florida. Juan Pablo Montoya was the slowest of the Team Penske drivers during qualifying but this was good enough for fourth on the starting grid. During the race, Montoya’s crew found the right setup and when race leader, Will Power, had a slow pit-stop he took the lead. Power made contact while challenging him for the lead and the resulting damage slowed Power’s car allowed Montoya to take the victory. The aggressive looking aero package on Ryan Hunter-Reay’s car clearly displays what Honda engineer’s thought would produce a competitive advantage. 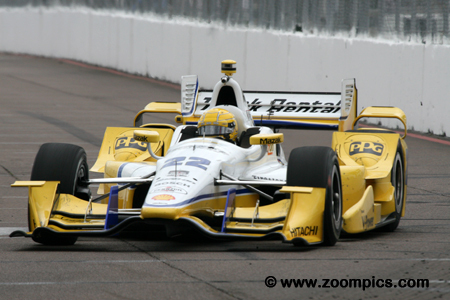 Hunter-Reay was the second quickest of the Honda-powered cars and started eighth. 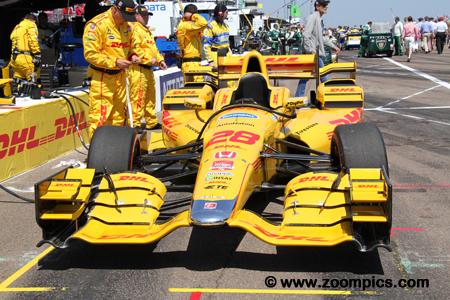 In the race he was the best of the teams using the Honda power plant – Hunter-Reay finished seventh. 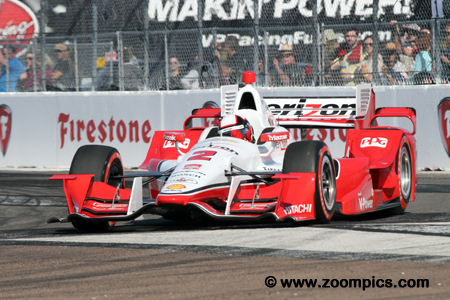 Defending champion, Will Power, opened the season by topping the timesheets in the first practice session. Power followed up this performance in qualifying by establishing a new lap record and capturing the pole. In the race, he continued this dominant pattern by leading 75 of 110-laps. His last pit-stop was slow and he came out behind Montoya. Power tried passing his teammate but damaged the car and had to settle for second. 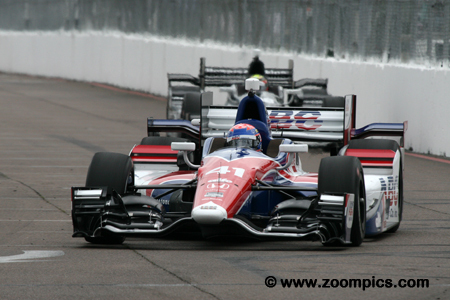 The best of the Chip Ganassi squad in qualifying was Tony Kanaan – he would start seventh. Great race strategy and well-timed pit-stops moved Kanaan up the order. At the checkered flag, he scored the last position on the podium. In doing so, Kanaan finished in the middle of the Team Penske entries. The Penske team and their Chevrolet-powered Dallaras dominated qualifying. Simon Pagenaud started second in the No. 22 Dallara. During the early part of the race, Pagenaud was chased by eventual winner Juan Pablo Montoya. After dropping to eighth mid-race, he fought back and when the checkered flag fell Pagenaud was fifth. 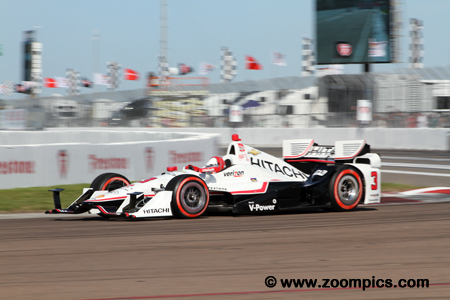 Contributing to Team Penske’s qualifying sweep was Helio Castroneves in the No. 3 Dallara. 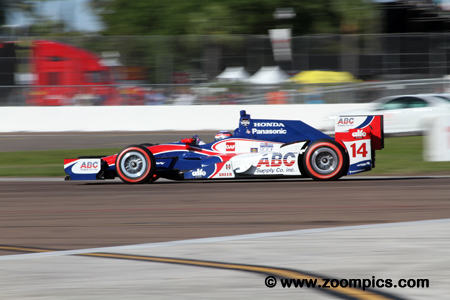 Castroneves was gridded third and at the start moved to second place. During a mid-race restart, he fell to sixth but work his way back to the front. 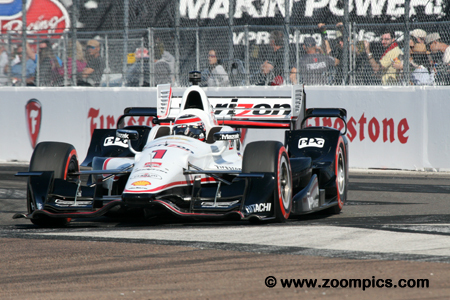 At the finish, Castroneves was fourth behind Juan Pablo Montoya, Will Power and Tony Kanaan. Based on the results during the first practice session, it appeared that it would be a good event for Jack Hawksworth. In the opening practice round Hawksworth was sixth but in qualifying a braking issue meant he could do no better than twenty-first. Hawksworth turned in a great effort during the race and finished eighth – the second best Honda-powered entry. The Chevrolet teams dominated qualifying with eight of their engines in the top-ten. Quickest of the Honda powered cars was the A.J. Foyt entry of Takuma Sato – he started fifth. Unfortunately, the race did not go well for Sato and he was thirteenth at the checkered flag. 2003 St. Petersburg winner, Sebastien Bourdais qualified sixth in the Chevrolet-powered Dallara for KVSH Racing. 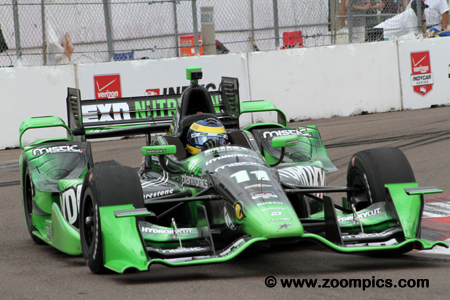 A steady race earned Bourdais a sixth place finish. 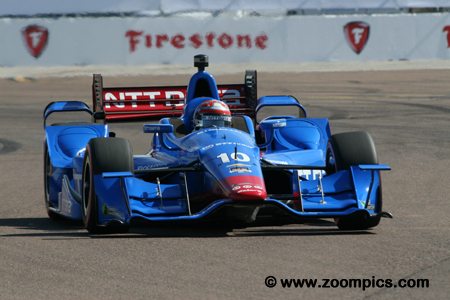 Scott Dixon, along with defending series champion, Will Power, were the quickest in preseason testing. When qualifying was over, Dixon would start from the ninth position. But problems would develop with the first round of pit-stops when the air jacks failed on his car. This issue dropped Dixon to the back of the field after every stop – he finished fifteenth.